Very few of us have the luxury of a dedicated room in which to put our speakers. In most cases we are squeezing them into a space that is too small or have to deal with a living or family room that is not symmetrical. Then there is the spousal factor that may keep you from putting the speakers where they need to be. In this article we will start to look at how to overcome some of these real world problems. This time we’ll look at how I dealt with a client’s room (let’s call him Bob) without having to go there to measure it. For you, that translates directly into a do it yourself project. We’re starting off with a fairly easy one today, a room that has a minimum of symmetrical problems. We’ll work our way into the big problems in the articles to follow. Bob had a fairly ideal scenario since he was moving into a new space. This meant that, while he already had furniture, he was not totally locked into art or esthetics. He was also willing to make some furniture changes, but would be happier if he could keep what he had. I felt that he had a workable arrangement and that there would be a minimal sacrifice of sound quality with his current furniture. 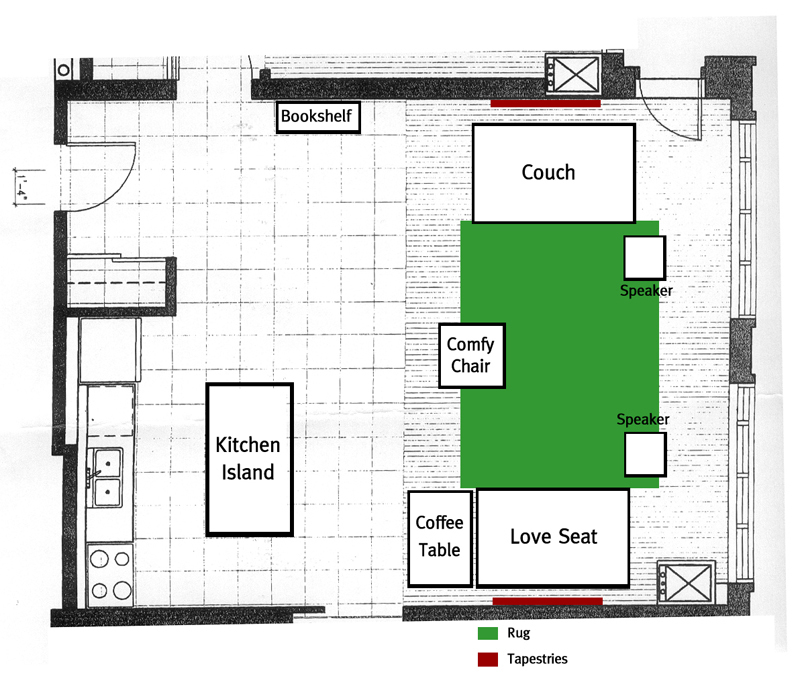 Bob sent me a floor plan of his empty room and one with the furniture and speakers arranged to his liking. Take a close look at Figure 1 and tell me “what’s wrong with this picture?” Instead of reinventing the wheel, throughout this article I’m going to refer you to the RHT archives and have you look at some of my past articles as a refresher and space saver. There are a few things that make this room less than ideal not matter how the speakers are arranged. In the upper right corner is a door that leads to a deck. Depending on its integrity, low frequencies could pass through this door. There also must be enough space for the door to swing fully open. The right wall is basically all glass. This can cause some serious first order reflections and the outside view must be maintained. Bass loss through the windows is also a possible issue. The kitchen is a very live acoustic space and will generate undesirably long reverb times. The kitchen island and closet are barriers that will affect the bass and the stove/sink/refrigerator counter makes the room non-symmetrical. But these are mostly problems that we have no control over, so let’s start with how we can make the biggest difference. The first problem is that the rug is green. This guy has no taste (just kidding, I like green). But where the rug sits is a problem because that’s where he put the speakers. He has a classic non-symmetrical speaker placement. The right speaker is loading into a corner while the left speaker hangs way out in space. The result is bad imaging and no bass symmetry. If you look back at Sound Advice 1, paragraph 10, figs. 3 & 4 you will see examples of why this is so. Bob wanted good sound but he also wanted a comfortable furniture arrangement for entertaining friends. This is what led him to the horseshoe layout of the couches and chair. Practical, but not beneficial. Please notice the location of the comfy chair. This location holds the possibility absorbing a fair amount of bass from the left speaker, depending on just how comfy the chair is. Also, unless the tweeter and midrange drivers are above the height of the chair, their coverage pattern will be affected by the chairs proximity. The couch on the right wall is sitting halfway in front of the right speaker. This could have an effect on the bass, and like the comfy chair, the mids and tweets. The love seat is in a good spot between the two speakers but rather close to the back wall. And so we come to the coffee table. Coffee tables are the bane of my existence. They sit low and directly in front of the listening position. The big hard surface causes highly destructive first order reflections. Bob’s table is large and while it is not that close to his love seat, it still will get some reflections. Look at figure 2. It shows the path length difference between the direct sound and the coffee table reflection. Note the little comb filter icon at the lower left. This is what happens to your sound when the coffee table reflection combines with the direct signal. Your brain cannot separate out the reflection and you get poo-poo. For better understanding, figure 3 shows the frequency response of a room that has a coffee table in front of the listener (note the uneven response). 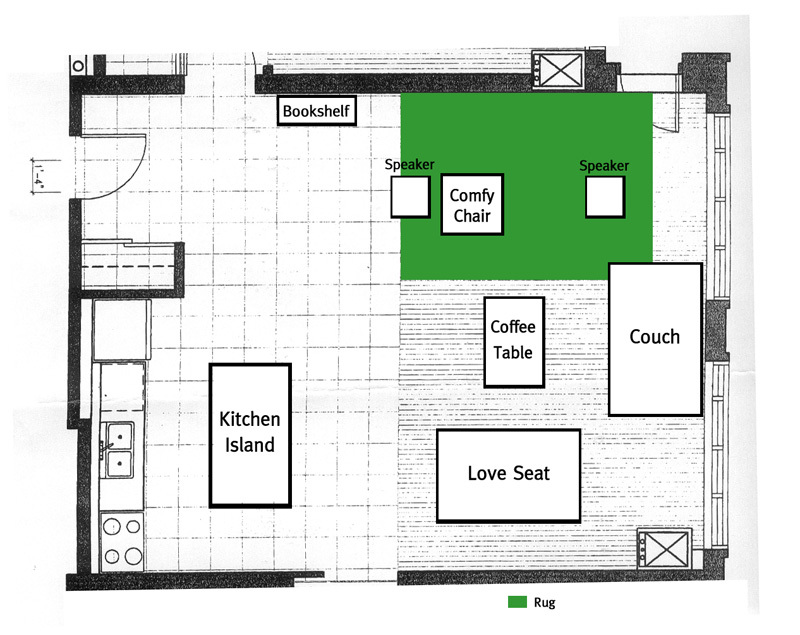 Figure 4 shows the same room with no coffee table (note the smooth response). Need I say more? Lose the coffee table! So how did I fix this whole situation? Well since I’m running out of space and a picture is worth a thousand words (or in this case, 150) take a look at figure 5. In order to give the speakers symmetrical boundaries I turned them to face the kitchen. This solves imaging and most bass response problems but not all. We still have the kitchen incongruities working against us but some things you have to live with. I used my RPG Room Optimizer program to get me in the ballpark of where the speakers work best in the room. For a refresher on RPG see my Sound Advice 2 article, paragraph 7. With my listening and speaker positions defined, I could now place the furniture. In keeping with Bob’s entertainment desires, I maintained a horseshoe shaped seating environment. The comfy chair now becomes the main listening position and the couch and love seat sit fairly symmetrically in the room. Yes they are a bit close to the speakers but not in too bad a way. They can actually help with sidewall reflections. And speaking of sidewall reflections, I added a tapestry on each wall to cut down on them considerably, once again utilizing and maintaining symmetry. Note that the view is also unobstructed for all. And on a final note, the coffee table is still in use but out of the way. If I were given the power, I would probably hang a curtain on a pull rod in order to cut out some of the reflection energy coming from the kitchen/entry. This could be pulled aside and kept out of the way just right of the bookshelf, and then brought into the room, centered behind the comfy chair for serious listening. Next time we’ll continue to get into more problematic non-symmetrical rooms. We’ll actually look at the problems I faced setting up my own living room.